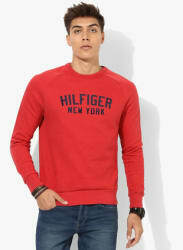 Tommy Hilfiger presents this red coloured sweatshirt, which is finished with contrasting print on the front, making it look appealing. The cotton fabric makes this sweatshirt soft and super comfortable to wear. Pair up this sweatshirt with blue denims and lace-ups.